Diddle, diddle, dumpling, my son Asghar. When I heard the “terrible” story about the missing shoe, my first reaction was to take the piss out of the poor deluded idiot who thought he was the victim of horrendous crime, then my memory was jolted by the thoughts of a truly awful story about shoes. Some years ago my wife, my brother in law and myself went on holiday to Kraków in Poland. We took the rather hesitant decision to visit Auschwitz and Auschwitz Birkenau extermination camps. I say “hesitant” because after all we were on holiday for pleasure, but we decided, rightly, that not to go was tantamount to denying the hellish things which went on there. We went first to Auschwitz 1 and after passing through the infamous ” Arbeit macht frei ” (Work makes you free) gate, we saw many reminders of the horror of that place, but it was in one red brick building that we saw, behind the glass of huge compartments, the mountains of shoes. There were men’s shoes, women’s shoes and children’s shoes, all twisted and dried out with age. There were also heaps of spectacles, tooth brushes, artificial limbs, suitcases, many with their owners names still written on them, and even heaps of human hair. The Nazi’s never wasted anything except the bodies of millions of Jewish human beings. The point of this is that all these shoes were also stolen, but not by Mossad. 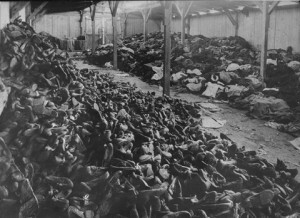 These thousands of pairs of shoes were stolen by people not all that dissimilar to the people that Muslim campaigner Asghar Bukhari supports, and would if given the chance repeat the sickening exercise with their desire to exterminate the Jewish people once again. If it really was Mossad who stole the anti-Semite, BDS supporting, Jew hater Bakhari’s shoe, maybe they were just trying to get some of their own shoes back. Click here to put Asghar Bukhari’s pathetic anti-Semitic shoe fetish into perspective.